I am here to tell you about a special spice that is an anti-oxidant and anti-inflammatory which means reduced swelling of muscles and joints, as well as reduced sore muscles! This wonder spice is TURMERIC! 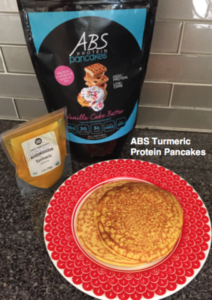 My friends at ABS Protein Pancakes have found turmeric to be a perfect addition to the ABS Vanilla Cake Batter Protein Pancakes to create a great post workout meal that will help you recover! Mix together ABS Vanilla Cake Batter Protein Pancake Mix with water, egg whites, and turmeric then set aside. Spray pan and make three pancakes by scooping or pouring out batter into pan. Cook for 40-60 seconds until bubbles begin to appear and pop. Flip over for another 40-60 seconds until golden brown. Top with your favorite Sugar Free Syrup and enjoy! There are so many different recipes that you can enjoy with these pancake mixes and every flavor of ABS Protein Pancakes is All Natural, Low Carb (Only 8g net carbs), Gluten Free, Non GMO, Low Sugar and Packed full of over 25g Protein! Summer is here, but you can still enjoy tasty, fluffy, make your mouth water PANCAKES!